Closed over $400 million dollars in real estate. Ranked in the top 1% of the NRT from 2004-2014. Howard is a building specialist and an expert in new construction, including properties at 160 West 12th Street (Greenwich Lane), 25 Columbus Circle (Time Warner Building), 310 East 53rd Street, Morgan Lofts, 56 Leonard Street, 310 East 46th Street, The Aldyn, The Rushmore and The Avery. Townhouse sales include 35 Charlton, 451 West 54th Street and 129 East 61st Street. B.S. in Business from the University of Buffalo. 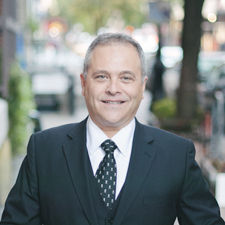 Howard joins Compass with fourteen years of experience in New York City real estate, during which time he founded The Spiegelman-Rothman Team. As founder and lead of The Spiegelman-Rothman Team, Howard hand-selected a core group of top-tier brokers whose client-centered approach focuses on accessibility and mobility. Together with his partner, Tim Rothman, the duo has sold over $400 million dollars in condos, co-op, Townhomes and new development. Honest, resolute, and knowledgeable, Howard’s focus on customer service and up-to-the-minute market tracking have earned him a sterling reputation as one of the industry’s finest. A lifelong New York resident, Howard grew up in Brooklyn and hails from a construction family. Due to his great-grandfather’s business, Howard learned to operate a jackhammer at the early age of 14. He has been in sales since 1986. Howard entered real estate with a desire to merge his hometown pride with a passion for creative deal-making. Equipped with a fleet of Vespas, there’s not a single square inch of New York City that he and his team cannot cover, even taking clients to see apartments on their lunch break. The team’s unique method of transportation is what allows them to handle their significant number of exclusive listings. A Manhattan resident of 25 years, Howard moved to the Upper West Side in 1990, where he lives with his wife and children, ages 4 and 2.